Jackpot Knights Casino has an amazing battle theme. This is a nice theme for players who are ready for some serious casino action! The website has a very simple menu, which features promos, payments, support and registration. The registration is also a very simple process. A request for some very basic information is made during the sign-up process. The total jackpots are listed on the side. Suffice to say, the jackpots look very impressive! The promo section looks good for a casino which isn't known for being in the top casino rankings. 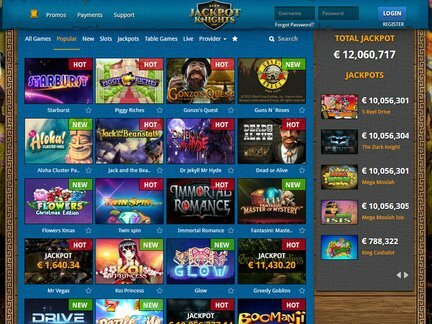 This Jackpot Knights Casino Bonus deal offer features €400 plus one hundred free spins. A free spin Monday is another great reward. 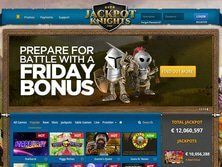 Twenty free spins can be credited to the knight's account. A Wednesday Double Surprise Bonus is also available on the site. It also comes with twenty free spins. The weekend battle is yet another great promo feature. On such days, the players can claim a 100% bonus up to €25. A couple of more deals could be added by the staff. However, the promo section looks very decent when compared against other casino offerings. The payment methods are the expected standard in the field. They would include; Visa, MasterCard, Skrill, Neteller, Visa Electron, PaySafeCard and Bank Transfer. The security of the transactions is guaranteed. In fact, the data protection policy is very strict. All information is stored on highly secure servers. The support for five languages allows for easier access to the casino. This is true for speakers of the following languages; English, Finnish, Swedish, Norwegian and German.It's important to mention that all the site's games are supplied by top internet casino software suppliers. They would include; NetEnt, 1X2 Gaming, Microgaming and Oryx Gaming. The terms & conditions section of the Jackpot Knights Casino refers to a few restricted player groups. It is impossible to open an account if one is a resident of the following countries; Burma, Belgium, China. Hong Kong, Macau, Denmark, Estonia, France, Iran, Iraq, Ireland, Israel, Italy, Japan, North Korea, South Korea, Laos, Libya, Malaysia, Portugal, Slovenia, Somalia, Spain, Sudan, Syria, Thailand, Turkey, United Kingdom, United States of America, US Minor Outlying Islands, American Samoa, Guam, Northern Mariana Islands, Puerto Rico and US Virgin Islands. The player's new account must be active. If it isn't used for a period of 60 days, a €5 fee is charged on a monthly basis. The casino appears to be getting plenty of hits from the European continent. The support for the € currency is a factor in the direction of the traffic flow. The hot games would include; Starburst, Piggy Riches, Gonzo's Quest, Guns N' Roses, Aloha Cluster Pav's, Jack and the Beanstalk, Dr Jekyll and Mr Hyde, Dead or Alive, Flowers Christmas, Twin Spin, Immortal Romance, Fantasini Master of Mystery, Mr Vegas, Koi Princess, Glow, Greedy Goblins, Drive Multiplier Mayhem, Dazzle, The Dark Knight and Boomanji. Some of the new titles would include; The Tipsy Tourist, 4 Seasons, Wild Orient, Sun Tide, Alkemor's Tower and Fruit Shop Xmas. Generally, the games can be divided as follows; Table Games, Slots, Jackpots and Live Games. The NetEnt jackpots aren't pooled at the casino. Otherwise, the players have not voiced any particular concerns. They appreciate the casino for giving them access to such a wide variety of games. All customer support service inquiries can be directed to the staff by e-mail. The nice thing is that live support is also available to players. JackpotKnights Casino is operated by Flavidius Limited from Cyprus. The casino operates under a license from Curacao, a licensing body which is popular among new casinos. Unfortunately, the license does not provide the same level of credibility as authorization from a more reputable body. Nevertheless, it is a sufficient ground for legal operations. I am very impressed by this relatively new online casino. It is very fun to play on a site with a knight theme. In my opinion, the promotions section rivals the best top casino offerings. To my surprise, I found a whole lot of free spin deals on the site. The welcome bonus was also very generous! I could recommend the casino in a heartbeat.